Gentle soothing relief for upset stomach and indigestion. Traditional mint flavour. 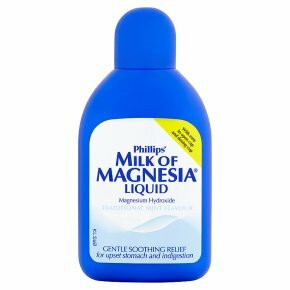 With easy to open cap and dosing cup.Magnesium Hydroxide What it does: Phillips' Milk of Magnesia Liquid (magnesium hydroxide) is used to relieve indigestion, excess acid and wind, heartburn and stomach discomfort. It can also be used as a laxative to relieve constipation. How to take: Shake well before each use. You can take Phillips' Milk of Magnesia with milk or water if you want. Drink plenty of fluid during the course of your treatment. Adults: Take one to two 5 ml spoonfuls (first or second line in dosing cup). Repeat as necessary to maximum of twelve 5 ml spoonfuls (60 ml) in 24 hours. Aged 3-12: Give one 5 ml spoonful (first line in dosing cup). Repeat as necessary to a maximum of six 5 ml spoonfuls (30 ml) in 24 hours. Under 3: To be given only on the advice of a doctor. Do not use for more than 14 days. Phillips' Milk of Magnesia can also be used as a laxative: Adults: Take six to nine 5 ml spoonfuls (30-45 ml measured in dosing cup) at bedtime. Repeat nightly, reducing dose until constipation is relieved. Aged 3-12: Give one to two 5 ml spoonfuls (first or second line in dosing cup) at bedtime. Under 3: To be given only on the advice of a doctor. Do not use for more than 3 days. If a laxative dose is needed every day or if there is persistent abdominal pain, consult your doctor. Do not take more than the recommended dose. You may experience diarrhoea. If you get this or any other side effects not mentioned stop using this medicine and tell your doctor or pharmacist. If you take too much Contact your doctor or casualty department. Do not take:<br>If you have ever had an allergic reaction to any of the ingredients listed below.<br>Check with your doctor before using this product if:<br>You have kidney problems.<br>You are taking any other medicines (including those you have bought yourself).<br>You are pregnant or breastfeeding.<br>Check with your doctor if symptoms continue.<br><br>Keep out of the reach and sight of children.